Brain Noodles: Stimulating toys that encourage hands-on learning. I set out to test this set of 12 soft, fluffy, pipe-cleaner-esque toys that seemed simple and open ended while offering such an appealing tactile sensation. The box was taken to a 2-hour class with one child with autism, age 8, and his two younger brothers, ages 5 and 2. My experience in teaching K, the child with autism, had already shown me how to engage him using his affinity for puzzles and playing in the window, as well as ball play in open spaces. He was not as interested in crafts. Since these Brain Noodles straddled the line between something used for crafting (such as sculpting or decorating with it) and a tactile fidget, I wasn’t sure how he’d react. K took to them immediately. He looked each one over carefully. He threw them in the air and across the room, ran to pick them up, threw them again and shrieked with delight. This went on for several minutes. Because these are soft and light and the ends are not sharp, I felt comfortable with him throwing them indoors around his brothers. K’s brothers also enjoyed the Brain Noodles. The toddler chewed and held tight to one of them. The kindergartner sword-played and tossed them like his brother. He also wrapped one around his arm. K followed suit, removing the coiled noodle and tossing it again. This time the colorful “zebra” noodle spiraled in the air, twisting and returning to him, like a curly boomerang. Soon all noodles were his to wrap around his arm, remove as they held their coiled shape, and tossed again. 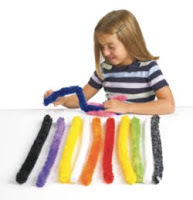 Then, multiple noodles were attached to create longer, colorful coils that could be tossed and bounced around the room. K played with these for almost an hour, undeterred and completely focused. He was active, happy and discovering something new. In this teacher’s opinion, Brain Noodles: a success! In the first place, auto title advances might be viewed as a secured advance since it requires a vow. In getting such advances, a borrower is required to give the title of his or her auto as guarantee. buy online Christmas costume clothes, toys, garden irrigation systems and parts, women’s/men’s clothing etc. The best products with the cheapest prices ever!